BROMSGROVE Ladies C made it back-to-back promotions after securing the Herefordshire & Worcestershire League Division Five East title in style with the 6-0 trouncing of Bewdley B. 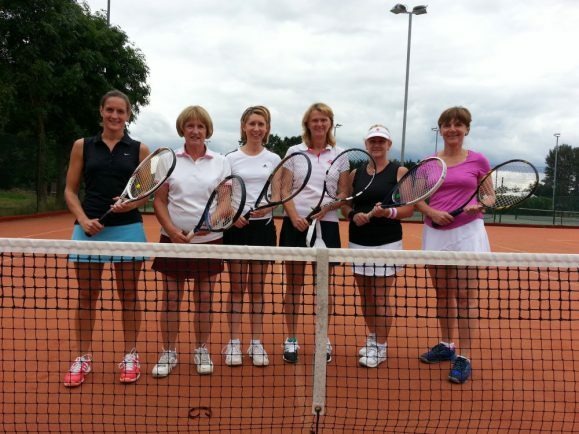 The team of Steph Armstrong with Beecy Smith, Lorraine Russell with Lisa Rushton and Diyls Thomas with Anne Simper put on an impressive display in their final match of the season, winning all rubbers in two sets. Unbeaten Bromsgrove opened up an unassailable 20-point gap at the top and the strength of the squad showed all season as they won 80 per cent of all sets played and averaged 12 points per match – equivalent to winning 5-1 every game. With regular captain Connie Wedelich away on holiday, Simper took over the captaincy for the day. Simper said: “We knew we needed a good result today against a team that has played well all season. To take it 6-0 just shows how well the squad has gelled. “After our promotion last year we were expecting a tough time but everyone has shown real dedication and fighting spirit when it mattered. The Men’s C also won 6-0 in their Division Five East clash against Hallow B. Highlights of the game included two great battles against Hallow’s first pair. Bromsgrove’s Tim Wright with John Casey and Tim Roland with Pete Morris were involved in long three-set battles but dug in to emerge victorious. With the rest of the Hallow team no match for Bromsgrove, Aaron Oakes with Trevor Errington – playing together for the first time – completed the whitewash. Victory leaves Bromsgrove just two points off the promotion spot with one game remaining. Unfortunately, the Ladies E team were on the wrong side of a 6-0 result in their Division Seven East clash against league leaders Pershore C.
The pairs of Chris Mitchell with Fay Giles, Cynthia Colley with Di Horton and Alison Douglas with Yvonne Priestman were no match for a strong Pershore side.